So the pigeon post arrived and brought a copy of Spoke Magazine 34 in which I have a several page article I wrote about the Saint Deep Summer Photo Challenge. Amazing pictures by Mattias Fredriksson and Dan Barham. 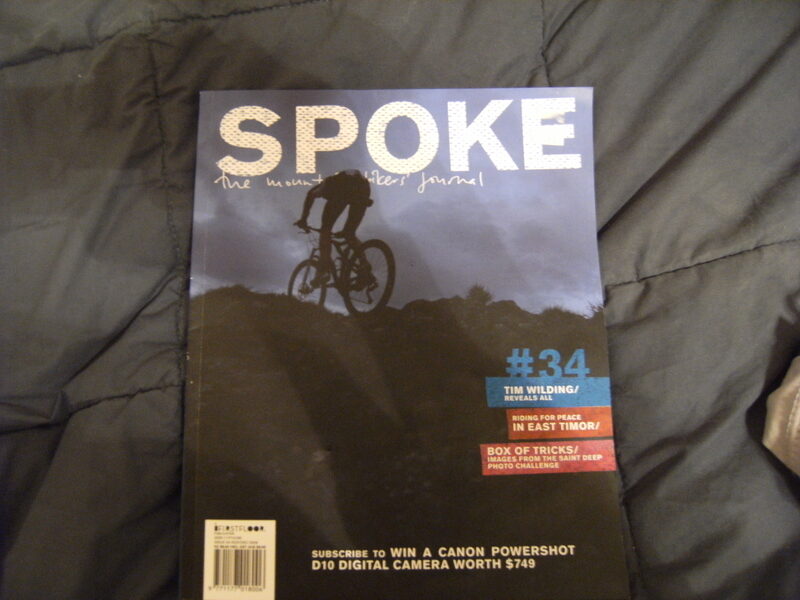 Spoke Magazine is one of my favourite magazines of all time. 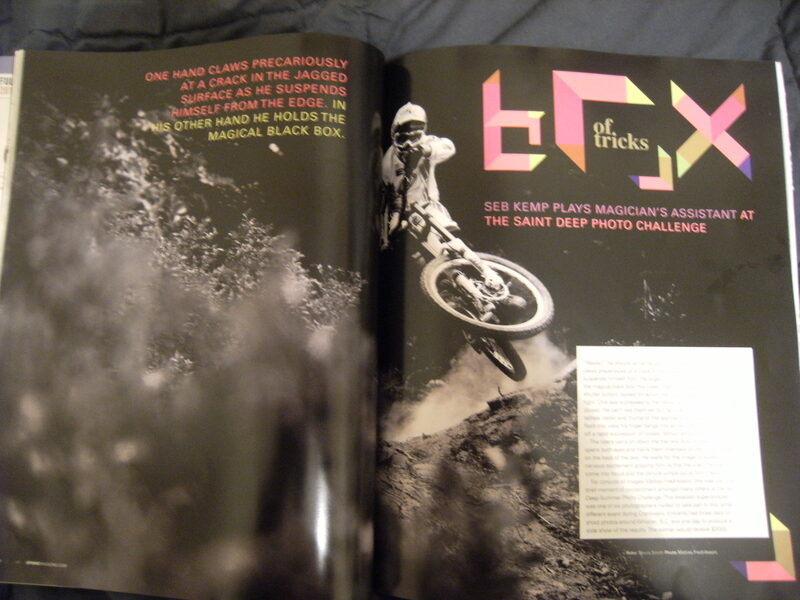 Beautiful print quality, superb layout, awesome photos, and a varied content. Eleanor Meecham is the editor there and runs a wicked tight ship. Caleb Smith is the man behind it all. He started it all and now is THE man for all affairs NZ riding. If you need anything sorting then he is the go to guy. “Ready!” he shouts as he hangs off the rock slab. One-hand claws precariously at a crack in the jagged surface as he suspends himself from the edge. In his other hand he holds the magical black box. His index finger twitches above the shutter button, poised for action like a gunslinger in a pistol fight. One eye is pressed to the viewer and the other is tightly closed. He can’t see them yet but he listens hard for the telltale clatter and thump of the approaching bikes. As they flash into view his finger bangs into action. The shutter sounds off a rapid succession of noises. Shhuct shhuct shhuct. For conjuror of images Mattias Fredriksson, this was just one brief moment of contentment amongst many others at the Saint Deep Summer Photo Challenge. This Swedish super-shooter was one of six photographers invited to take part in this rather different event during Crankworx. Entrants had three days to shoot photos around Whistler, B.C. and one day to produce a slide show of the results. The winner would receive $3,000. That’s it. The rules were simple and the parameters loose. With no set assignment or list of required shots, photographers had to come up with their own theme and a personal interpretation of riding in Whistler––a sublimely difficult task. At the end of the night the judges gave Mattias the win and the biggest cheque. After helping out at this year’s competition––as Mattias’s right hand man and human tripod (a title I have been fighting to receive for years)––I can’t wait for next year’s event. The bar has been set high and he will be back next year with even more tricks up his wizards sleeve. He will need to come back with more tricks because I’m pretty confident there will be an even hungrier and larger mob of photographers hoping to take the top prize and the glory. January 17, 2010 in BRITISH COLUMBIA, LOOK AT ME MOM!, N-ZHRED, SPOKE MAGAZINE.